Not longer after previewing the Binance DEX on Medium for users to catch a glimpse and prepare for the trustless, secure, and sleek platform, Binance has delivered – announcing the public launch of its testnet on Wednesday, February 20th. Before continuing, we recommend checking out our past article on Binance’s previewing of their decentralized exchange, which also details the core differences between centralized and decentralized exchanges. Addressing all Binancians, Binance emphatically noted the new Binance DEX and Binance Chain (a new blockchain developed and released by Binance) and their entrance into the public testnet phase. The press release also acknowledged several other releases, including a web wallet and access to the Binance Chain Explorer. Let’s take a closer look at the release of Binance’s DEX and why the community is so excited (or should be). Most are wondering whether the launch of the Binance DEX could be the end of speculation and concern surrounding decentralized exchanges, as they’ve notoriously been plagued by a perceived higher barrier to entry, lower trade volumes, and low liquidity. Specifically, the Binance DEX is a high performance and user friendly platform built on top of Binance Chain, sanctioning users to create, issue, and trade digital assets. Furthermore, “CZ,” as he is so well-known by in the crypto community, believes the DEX is a step in the right direction for furthering crypto accessibility and adoption, due to its similar interface to Binance.com, heightened security features, and token options. And, it doesn’t hurt that Binance Chain and the Binance DEX can handle the same trading volume as Binance.com, remedying a fundamental issue plaguing traditional DEXs – speed and power. Other crypto actors in the space have already hit the ground running with the news, with Trust Wallet – a recently acquired Ethereum and multi cryptocurrency wallet acquired by Binance – and Ledger – the most popular selling hardware wallet – having already integrated with the Binance DEX. 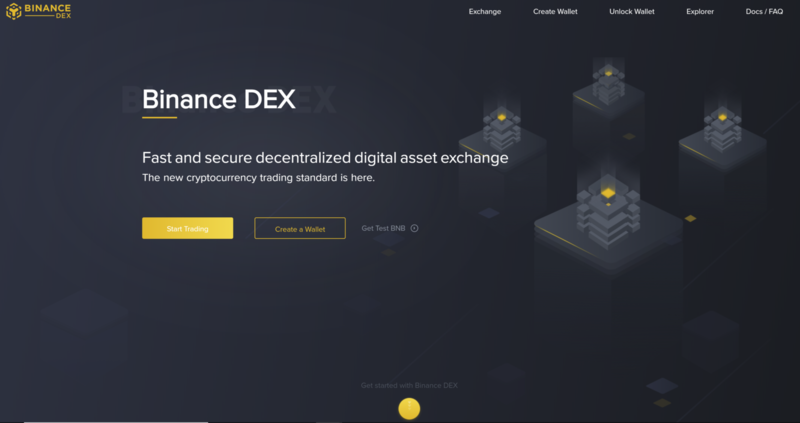 To access the Binance DEX Testnet with your Ledger Nano S check out this article by Ledger – https://www.ledger.fr/2019/02/20/ledger-supported-on-the-binance-decentralized-exchange-dex-testnet/. If you’d like to try out and fund your Testnet account, check out this walkthrough here – https://www.binance.vision/tutorials/binance-dex-funding-your-testnet-account. When getting started, users will receive 200 Testnet BNB to interact with the DEX and try out new features. The Binance Academy tutorial does warn users not to send real mainnet tokens to the Binance Chain Testnet, as it is strictly for TESTING purposes only. Also, make sure not to share your private key or mnemonic phrase with anyone (or forget it) and steer clear from sending large, aggressive orders at once. Finally, it bears repeating in this market to watch out for phishing scams and any websites/account which promise any benefit or gain on tokens on the Binance chain (the tokens have no monetary value). You can find the official press release by Binance over at their ‘News’ corner, or by heading on over to their Twitter. Make sure to keep up with the latest blockchain and cryptocurrency news and informative articles by heading on over to our blog, or by following us on Medium.